October 31st: Now this blog is not for the faint hearted or vegetarians, and Mum you are not going to enjoy the ending of this story so you might want to stop here!!! We were in Hwange National Park on our last game drive in Zimbabwe, we started at 6am and had seen a little activity but nothing to write home about. So we drove to the same platform we saw the 200 elephants at the previous evening (See Nelly the Elephant blog). We approach and see mostly Giraffe’s and Zebra’s at the watering hole. So we climb up and start watching. we notice the Giraffe’s and other animals are looking in one direction as if watching something. The eye’s start to adjust and someone with binoculars shouts “Lion”, we look across in the direction, “2 lions”….”3,4,5 lions”….”they have a giraffe”. What emerges is that overnight a Giraffe has been scared away from the watering hole by something and caught its self fallen and appears to have broken his leg (we come to understand this fact later). 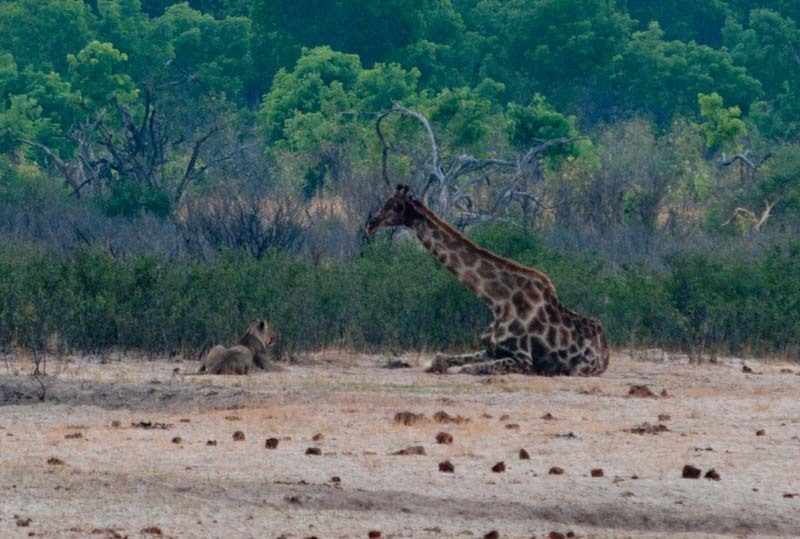 Come dawn this felled Giraffe has since been found by 5 Female Lions. From our arrival the lions have laid claim to it and are sat round protecting it. We see only blood on its head and its very still, we see blood all round the face of the main lioness, we assume its already dead and now food for a few days for this pride. But what we are to then witness is the rawness of nature. 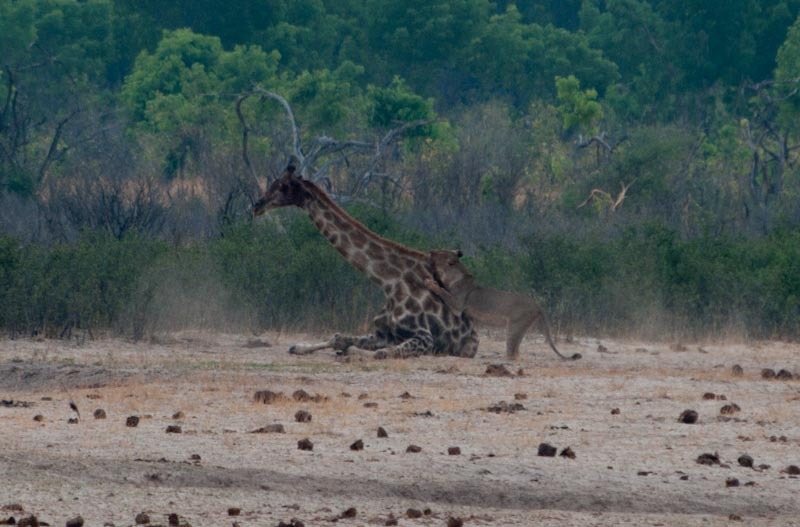 As we watch the Giraffe lifts its head, its still alive, the lions do not move they watch. 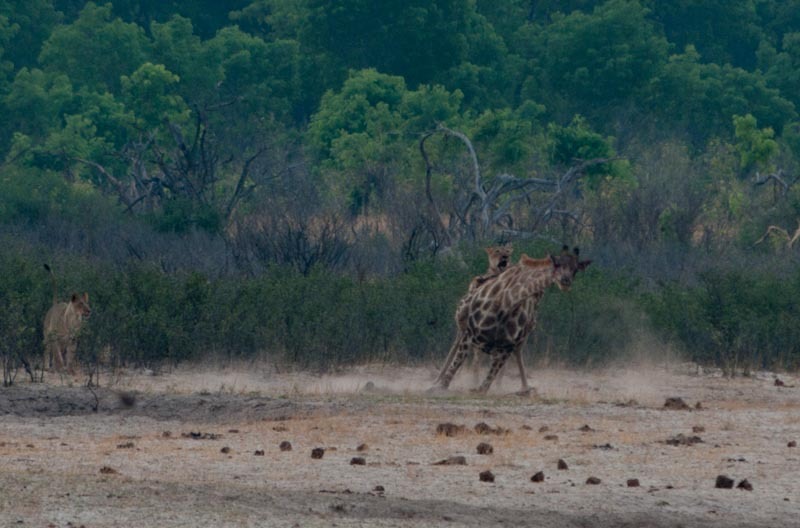 The Giraffe appears to muster energy and clambers to its feet, its up but it clearly has broken its front leg and collapses again as it tries to run on it. The lions remain un-phased and unmoved. 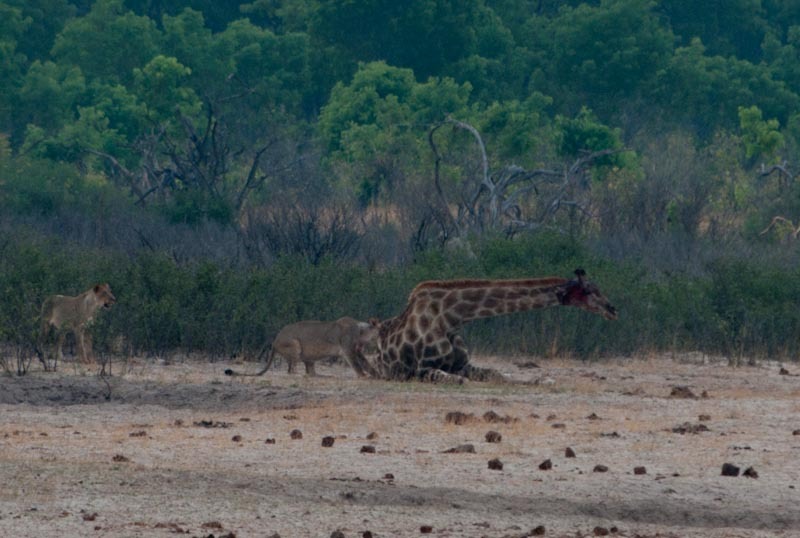 The giraffe is not quite down so its tries again, failure, this time a lion musters, it claws and bites the Giraffe’s back, it goes down and is still. This time the belief is the Giraffe is done, its not 5 minutes later its tries again with the same failure. This becomes the pattern for the next hour and a half. Each attempt gets weaker and each put down gets stronger. The lions do not kill the Giraffe though, its thought the longer the Giraffe is alive the fresher the meat and an animal of this size will last the pride a day or two. We sit and watch this act of nature with awe and amazement, a few are turned off by the suffering of the giraffe, but you cannot help but feel lucky to witness such a display of nature with your own eyes. I’ll leave you with some photographs of the encounter, I feel very lucky so see this and bring you the photographs.